The Garden Asparagus is widely and popularly cultivated as a vegetable. Besides providing food, it is ornamental and contains numerous medicinal properties. Wonderful to add this edible plant to your vegetable garden. We love to consume them quite regularly. Just stir-fry with lots of garlic. 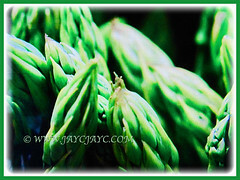 Botanical Name: Asparagus officinalis (syn. 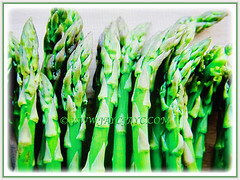 : Asparagus caspius, Asparagus hortensis). 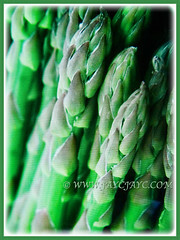 Common Names: Asparagus, Garden Asparagus. Etymology: The genus Asparagus is from the Greek asparagos, meaning sprout or shoot, referring to the succulent shoot tips. The specific epithet officinalis in Latin means of the dispensary, alluding to the medicinal properties of the plant. Origin: Native to Europe, Asia as far east as Mongolia, and northwestern Africa including Algeria, Morocco and Tunisia. Plant type: A herbaceous, rhizomatous and perennial plant. 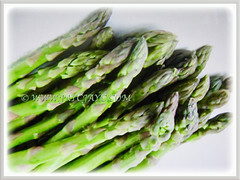 Features: Asparagus officinalis is from the genus, Asparagus that consists of up to 300 species of flowering plants. An upright herb that grows up to 2 m tall, with a rhizome or underground stem from which it re-grows. This perennial plant can live up to 20 years. It has a fleshy and stout stem that grow singly or in clumps. The stem is segmented with nodes around 30 cm apart, giving them a superficial bamboo-like appearance. True leaves are reduced to scales on the stem or spines at branching points. They are 6–32 mm long and 1 mm broad, and clustered 4-15 together in a rose-like shape. Green cladodes or stems, measuring up to 25 mm long act as leaves and are fine, flattened and produced in clusters. There are 1–10 cladodes per cluster. The flowers are usually dioecious with male and female flowers borne on separate plants but sometimes hermaphrodite flowers are found. Flowers of both sexes are bell-shaped with six tepals partially fused together at the base. They are produced singly or in clusters of two or three in the junctions of the branchlets. Male flowers are 5–6 mm long and yellow while female flowers are about 4 mm long and yellow-green. The pedicels or flower stalks are up to 25 mm long. The fruit is a small red berry approximately 6–10 mm in diameter and contain up to six black seeds. The seeds are black with a wrinkled and brittle seed coat. The berries are poisonous to humans. 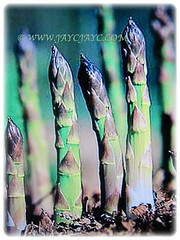 Culture (Care): Asparagus officinalis or Garden Asparagus can be easily grown with least maintenance. Others: It is essential to remove all the weeds as it will be extremely difficult once the Garden Asparagus has been planted. Generally free from serious pest and diseases. However, Asparagus beetles and Japanese beetles can be a problem. For subtropical and temperate regions: Hardiness: USDA Zone 3-11. The spears of Asparagus officinalis or Garden Asparagus emerge in spring but should not be harvested in the first season after planting. 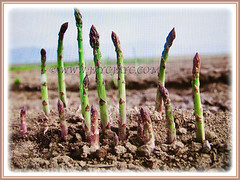 This is to ensure the food generated by the asparagus top growth remains to build up the crown of the plant underground. In the second year, a light crop of spears can be taken although some recommend not taking any. Spears should be harvested when approximately 15 cm tall, cutting them just below soil level. Spears from one plant should be harvested for no more than 6–8 weeks. When the asparagus foliage has turned yellow in the autumn, it can be cut down to just above soil level. A general purpose fertiliser or well-rotted organic matter, such as well-rotted horse manure or compost can be incorporated to help improve soil structure. It is necessary to keep the site free of weeds. Plants eventually grow into towering ferns in the summer and then die off after frost and are dormant during the winter.Asparagus is a heavy feeder. You should also give it a dose of fertilizer in mid-spring when they are actively growing. Propagation: Easily propagated from seeds. However, it can take an additional year to produce the first crop. Some gardeners find it easier to grow from crowns. 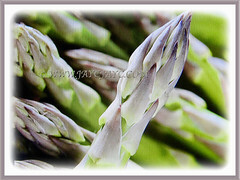 Usage: Asparagus officinalis or Garden asparagus is sometimes grown as an ornamental. Nevertheless, the primary use of asparagus is as a vegetable. As a fresh vegetable, it is lightly boiled, steamed, blanched or grilled and often served with butter. 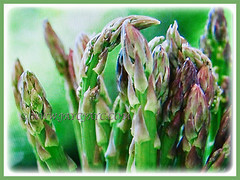 Excellent to grow asparagus in the vegetable garden. Foliage can be used in floral arrangements. Asparagus officinalis has many medicinal uses. 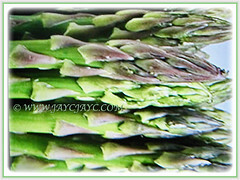 Extracts of asparagus root are used for treatment of inflammation of the urinary and kidney problems, jaundice and sciatica. It is used in the treatment of rheumatic conditions, tuberculosis, as a mild laxative and sedative. Asparagus is also a rich source of glutathione, a powerful antioxidant that is known to boost the immune system, reduce inflammation and maintain the health of the liver. 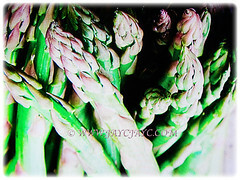 Asparagus is a useful companion plant for tomatoes as the tomato plant repels the asparagus beetle. Asparagus may repel some harmful root nematodes that affect tomato plants.